Brown's autopsy was the basis for Kenneth Goldsmith's work. 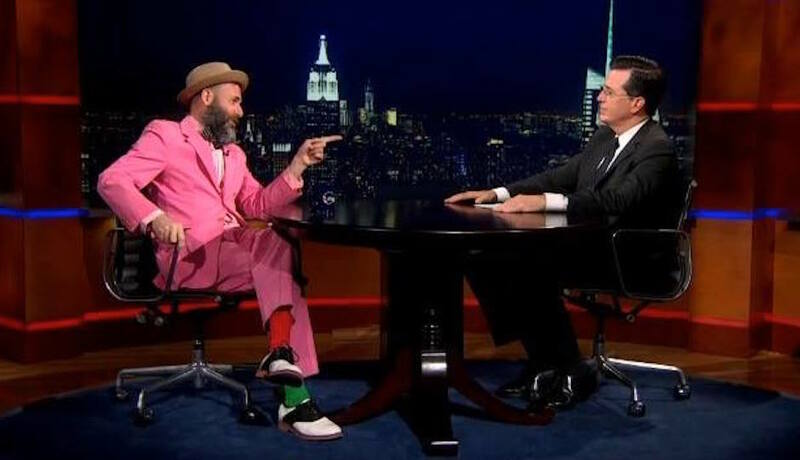 By Joel Mathis·	 3/19/2015, 6:31 a.m.
Kenneth Goldsmith, left, appeared on The Colbert Report in 2013. A Penn professor has stepped into controversy for a new poem describing the autopsy of Michael Brown, the young man whose shooting by a police officer in Ferguson, Mo., sparked months of protests around the country. Many audience members and other performers felt “profoundly uncomfortable” following Goldsmith’s performance, said co-organizer Francesca Capone GS, who is studying literary arts. Two other scheduled performers expressed reluctance to present, and so organizers decided to end the event early, Capone said. Many conference attendees criticized Goldsmith, a white male, for appropriating a black body for his poetry, thereby aestheticizing racial violence. “As much as 20th century art and literature would like to promote the erasure of the author, as Goldsmith does, he is enacting a history of violence and appropriation of marginalized bodies,” said Rachel Ossip ’15, a fifth-year student in the Dual Degree program. The conference concluded Sunday with an open discussion that included prepared responses from attendees. In the wide-ranging conversation, Goldsmith’s performance became a jumping-off point for a discussion of underrepresentation of people of color in poetry, fine arts, higher education and the “Interrupt” conference itself. Much of the criticism involves whether Goldsmith, a white man, appropriately used minority suffering for his own art. On Monday, Goldsmith announced he was asking Brown University not to make public a recording of his reading. “There’s been too much pain for many people around this and I do not wish to cause any more,” he said. Goldsmith has long been well-known in the world of poetry, giving a reading at the White House in 2011 and appearing on The Colbert Report in 2013. That same year, he was named the first poet laureate of the Museum of Modern Art.